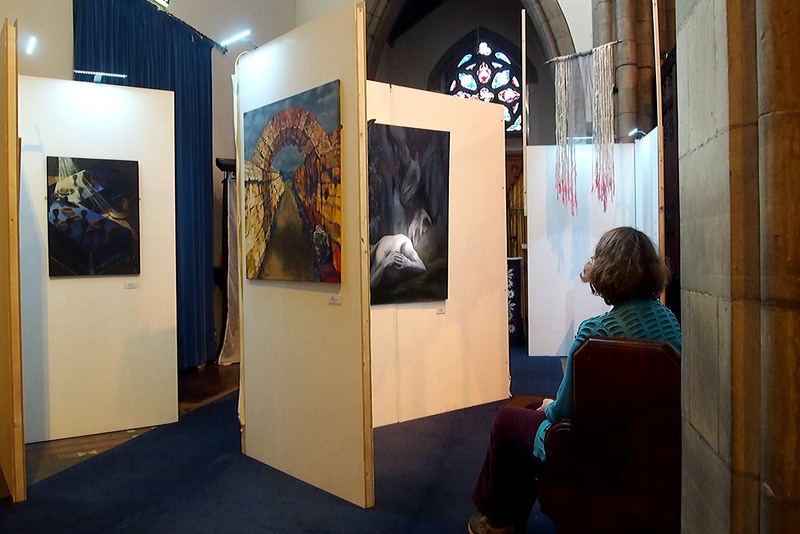 Simply by providing a pew facing art, creates an unspoken invitation to linger. A support for extended thinking. Another help is an Audio Guide. This gives you all the information of a handout, but in a way which does not require you to look at paper – it is read to you. The first 16 tracks of this year’s audio guide, in English, have readers from over 10 churches reading the witness accounts from the Bible, of Christ’s suffering and death. For folks who take the offered audio guide option, there is a noticeable engagement with the exhibition. Pictures and sound work together. Today, I was moved to watch two people I know well, both following the audio guide but one around a corner so they could not see each other – at the same moment bow their heads in stricken grief as they listened to the story of the first Easter. Thank you again to everyone who took part in recording the readings for the audio guide. They are profound. This entry was posted in Art of Easter 2015, Contemplation and tagged art, Art of Easter, audio guide, Contemplation, Ignatian Spirituality, Inverness. Bookmark the permalink.